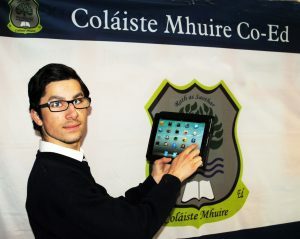 We are working with a company called Wriggle www.wriggle.ie to ensure that the ipad initiative is a success. You can access the wriggle store at http://store.wriggle.ie/colaiste-mhuire-co-ed. A code is sent out via text to parents also. Most interactive learning resources for pupils with Dictionaries, Maps, Globes, Translators, Maths help etc.